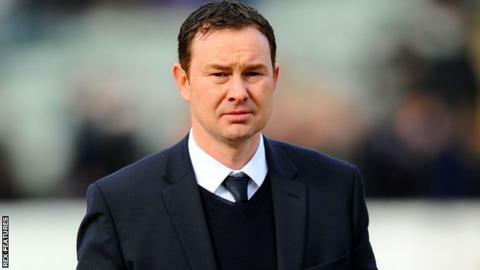 Plymouth Argyle manager Derek Adams says the club's financial position has forced him to bring in more loan players than he is allowed to pick. Argyle currently have six loanees but can only name five in a matchday squad. "It's a situation that I don't want to have, but it's a situation that I've been put into because of finances. "We have to take in loan players because at the start of the season we weren't able to take in the squad that we were capable of," Adams said. "I had to take in eight players at the start of the season, five permanent and three loan signings and from my point of view I would rather we had a core squad. "It'll be better next year when the loan system will be tightened up," he told BBC Radio Devon. The Pilgrims brought in Fleetwood Town striker Jamille Matt on loan earlier this month, forcing Adams to drop his other on-loan striker Daniel Nardiello. With the loan window closing on Thursday, Adams has not ruled bringing in a seventh loan player, or that one of his current temporary recruits could return to their parent club. "There's possibilities that could go both ways, it might just go one way, but within 24 hours anything can change," he added. "I wouldn't want that (a loan player leaving Plymouth) to happen, but the nature of the game is you've got to spin the discs and keep them flying and keep everything going and see what happens."